Meat can often lose moisture and flavour after being pureed. This can be solved by cooking the chicken in a delicious sauce or liquid. Bring milk to the boil in a large pan and whisk in KNORR Roux until thickened. Add KNORR Chicken Booster, whisking constantly until smooth and combined. Add chicken and zucchini, place over medium heat and cook, stirring constantly until chicken is cooked through. Strain chicken and zucchini, place in a blender, add CONTINENTAL Professional Instant Mashed Potato Mix and puree until smooth. Place into chicken moulds and freeze for 24 hours. Refrigerate the sauce and reheat to use. Reheat chicken portions on a tray. Place the reheated chicken on a serving plate and pour over the sauce. 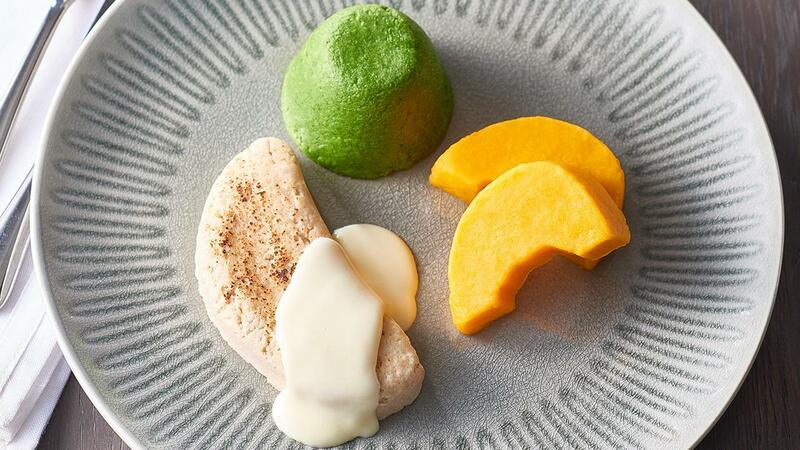 Serve with pureed broccoli and pumpkin shaped in their respective moulds. Adding vegetables to the meat puree helps with nutrient intake and adds flavour.